Cutting edge length: 4.60 in. Description: Lee Ferguson's knives are in great demand - from his stunning daggers, to his mighty broadswords and highly functional, yet profoundly elegant hunters. 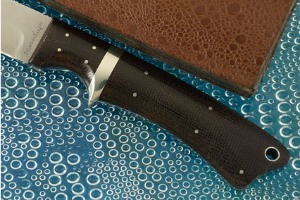 He creates some of the finest knives offered for sale in the world. 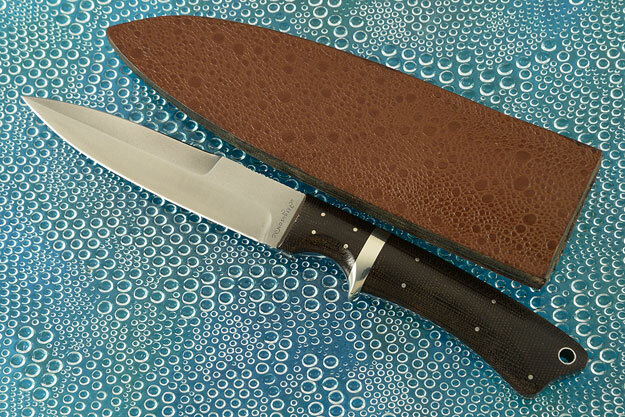 Unassuming hunting, fishing and woodcarving knives are Lee's bread and butter. This tactical boot dagger has been in a private collection. It is in new condition and by all appearances, Lee could have made it yesterday. 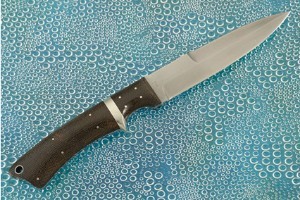 Lee began by hollow grinding 440C stainless steel into a perfectly proportioned five inch boot dagger blade. Both edges are razor sharp. dagger blade. 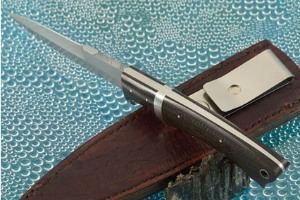 The blade features a non-reflective stonewashed finish. The left ricasso features Ferguson's makers mark. The right ricasso is marked '492'. 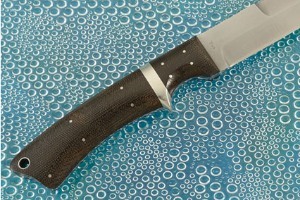 The green canvas micarta handle is nicely carved for a secure, comfortable grip. A deep finger choil and central 'guard' ensure the handle will never slip out of your hand. The spine is hand knurled for a secure thumb purchase. The handle is completed with a lanyard loop. Showing Ferguson's attention to detail, both the blade and tang are distal tapered, ensuring a perfect balance. 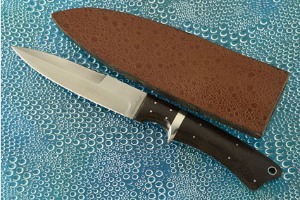 The knife is accompanied by a leather sheath with cane toad leather overlay. Exceptional work throughout! 0.1083984375 0.0302734375 108.3984375 30.2734375 Trailer Started. 0.203125 0.0947265625 203.125 94.7265625 Trailer Completed.